Returned Sunday afternoon from four days and three nights in Hong Kong. The purpose of the trip was to meet a group of Xangans who were visiting from Los Angeles, Vancouver, Jakarta, and Singapore. Our own mini Xanga meetup, I guess. The city was lit up with holiday displays, as spectacular as ever, if not more so. The weather was moderate for the first few days, but took on a damp chill near the end of my stay. It made for a pleasant break from the warm weather we have had in Bangkok. Different people were available on different days, as many had other friends and family members to visit while in Hong Kong. Nonetheless, there were plenty of fun activities. We rode many different modes of transportation, including the gondolas on Lantau Island. After soaring to new heights, we visited the Po Lin monastery and had a vegetarian lunch. 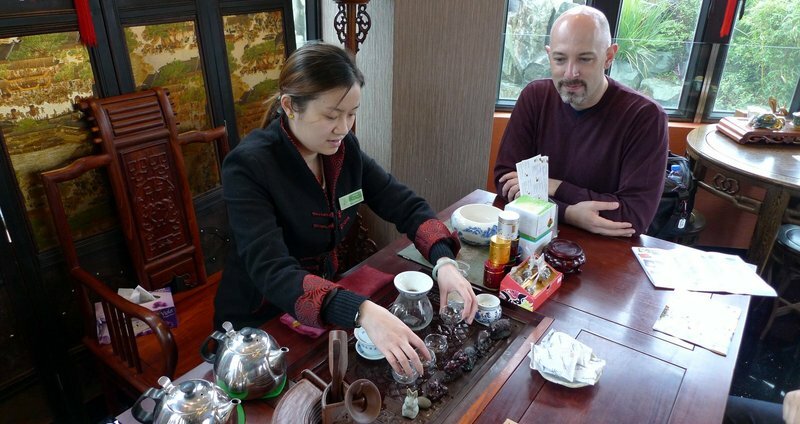 We had the opportunity to learn about the intricacies of Chinese tea while dodging some rain. We found ourselves in crowds, waiting to eat at popular places. We tried intriguing and tasty foods. 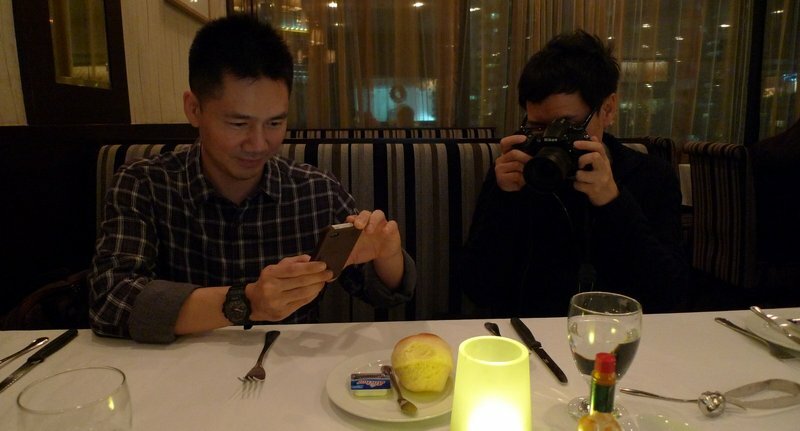 And, of course, we took lots of pictures of the food – even things as mundane as dinner rolls! More details in the coming days. Even though Thailand doesn’t officially recognize Christmas, we still had the opportunity to celebrate, gathering at the house of friends for a 16-person dinner. 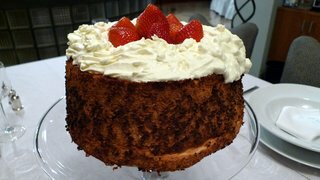 It was several days in the making and, of course, I was in the kitchen, too. 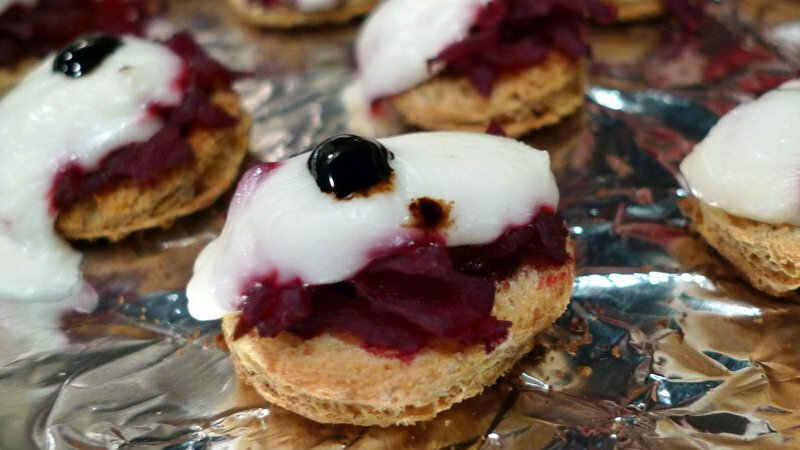 Simple canapes: white bean hummis with roasted red pepper and sundried tomato chutney, and shredded roasted beetroot with fresh mozzarella and a drop of balsamic and black truffle syrup. 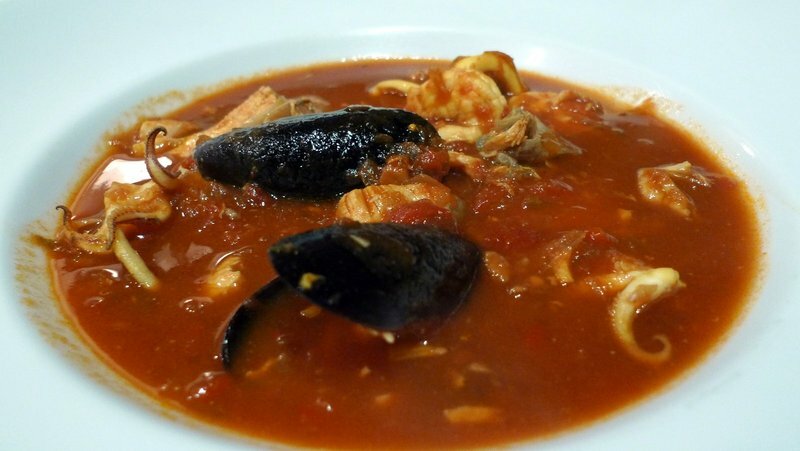 My latest version of cioppino, the classic San Francisco Italian style seafood stew. This recipe is from chef Michael Mina and is even nicer than the previous recipe I used. 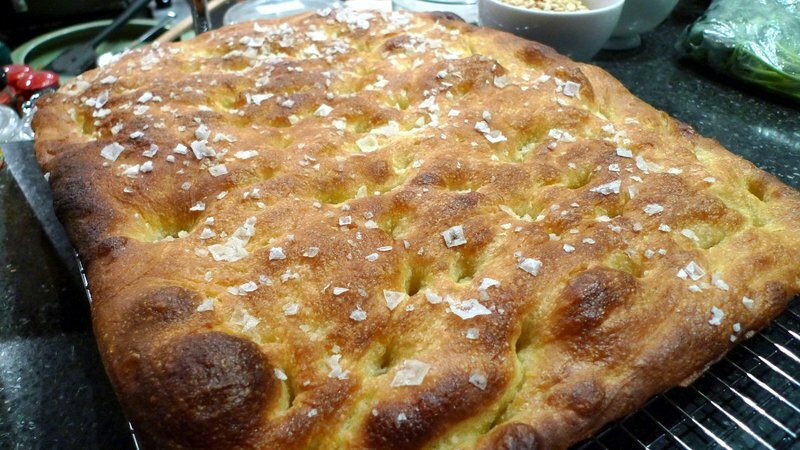 A beautiful foccacia bread sprinkled with flaked sea salt – perfect for sopping up the broth from the cioppino. One of our two stuffings, this one made with mushrooms and the other with chestnuts. 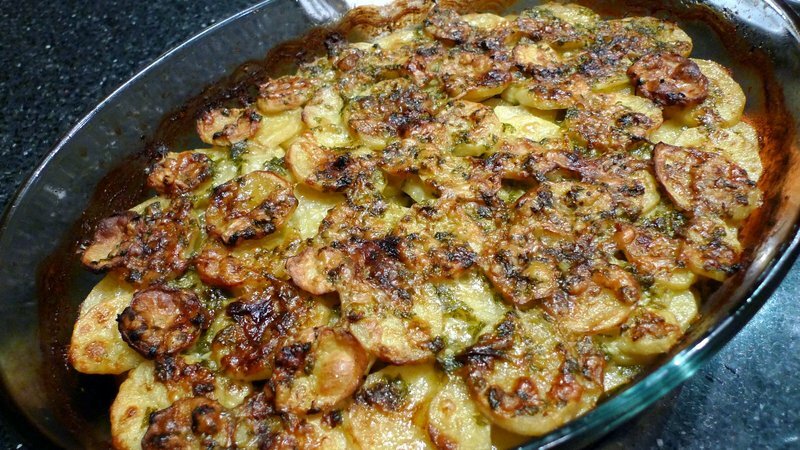 Potatoes dauphinoise, thinly sliced with a rich and creamy interior. 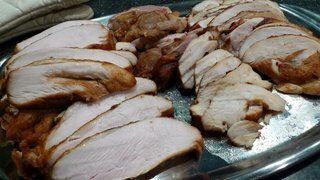 Sous video turkey, super moist and perfectly cooked, dropped in a deep fryer at the end for a crispy exterior. 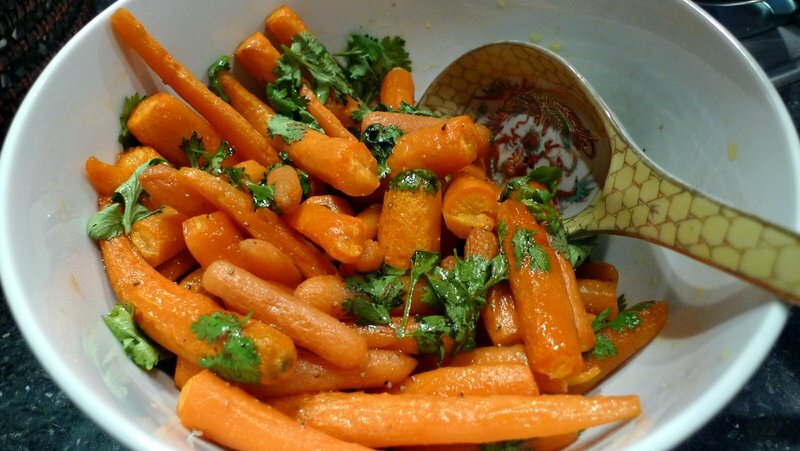 Carrots roasted with maple syrup and sprinkled with corriander. 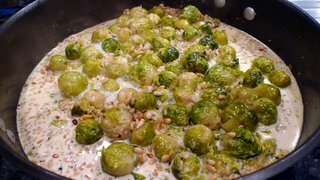 Creamy Brussels sprouts with roasted pine nuts. Desserts are served! 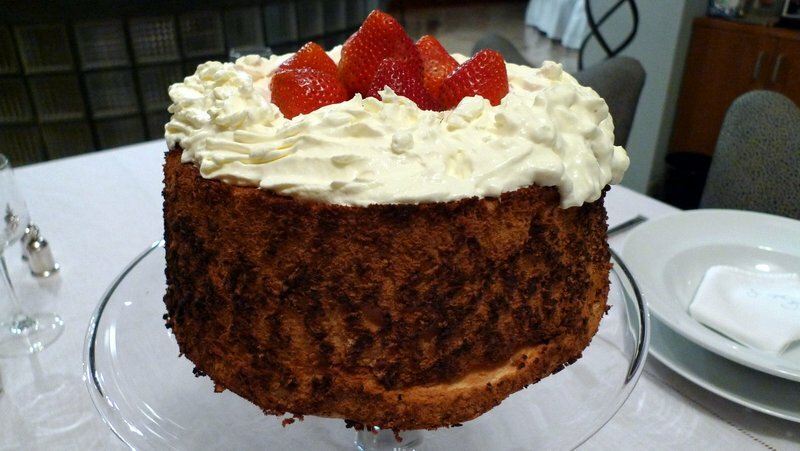 Angel food cake with whipped cream and strawberries – elegant – and a coconut cake with fresh coconut in both the cake and the buttercream frosting. Served with homemade peppermint and pineapple ice creams. Bee, Doug, Oates (former Xangan), and Tawn pose mid-way through dinner, trying to pace themselves so there is room for the cake. 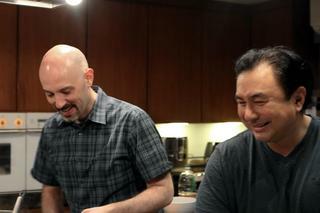 After our dinner, half the group stuggles to remain upright. From left, Linda, Doug, Bee, our hosts Nat and Cha, Tawn, and me. Hope you and yours had a happy celebration, too! 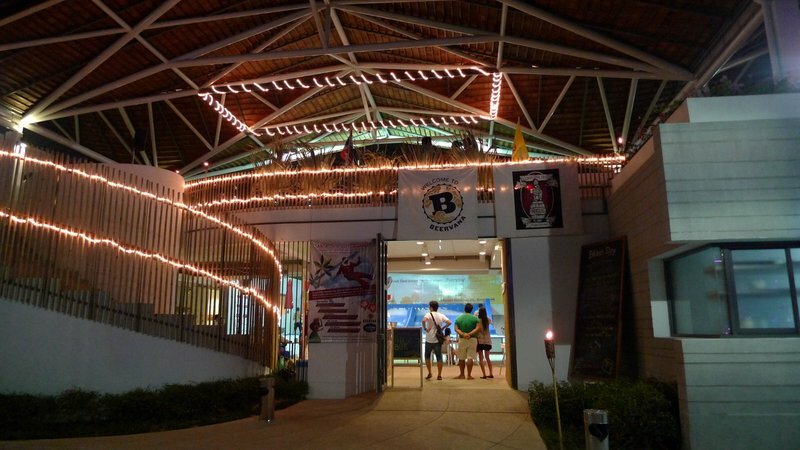 Bangkok-based Beervana, a specialty beer importer, recently sponsored a Christmas Luau, a Hawaiian feast cooked by chef Tim Butler (from Eat Me restaurant) and hosted at Flow House, Bangkok’s first spot for “indoor surfing” on the FlowRider wave machine. Bangkok Glutton writer Chow invited me to come along for the fun. It was a warm and windless evening, which didn’t bode well for an outdoor dinner. 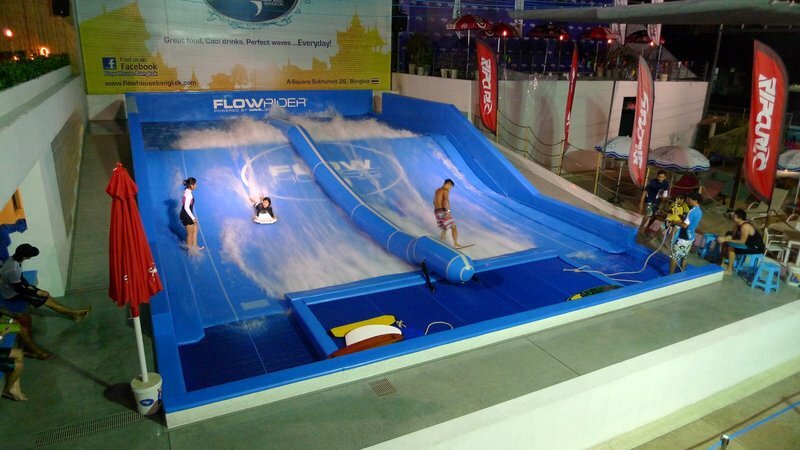 The location, Flow House Bangkok, is on Sukhumvit Soi 26 near Rama IV Road. It has a nice second floor terrace that overlooks the Flow Rider wave machine and provided a private dining space for our twenty or so diners. The Flow Rider provided plenty of entertainment, watching the (mostly younger) crowd surf on this high-powered sheet of water. Especially fun was to watch how, when they wiped out, the spray of water would carry them up the ramp and onto the platform at the top of the wave. Looks like fun! While we waited for dinner to be served, Beervana’s owners plied us with a couple of their imported beers. Beervana searches for unique beers with character. They are typically non-pasteurized and non-filtered and are made by small, independent brewers. While I’m not a beer drinker, several of their beers were very enjoyable and all paired well with the food. 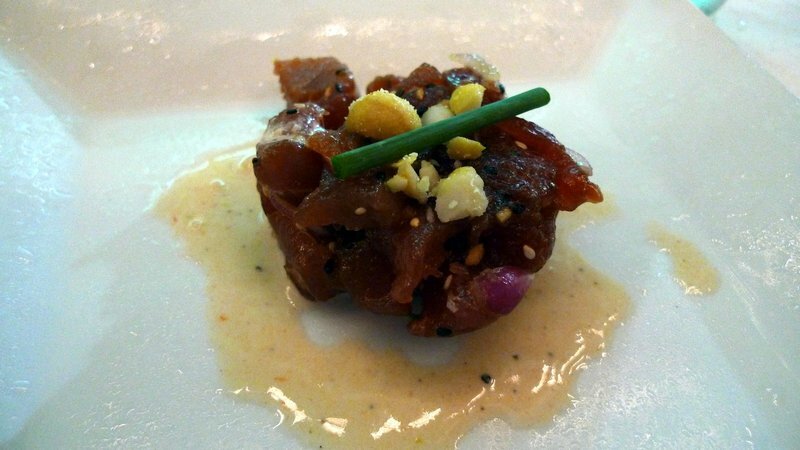 After a bit too long of a wait, the first course arrived, an ahi tuna poke with ginger and chili coconut vinaigrette. Poke is a typical Hawaiian dish generally made with raw fish mixed with various dressings. 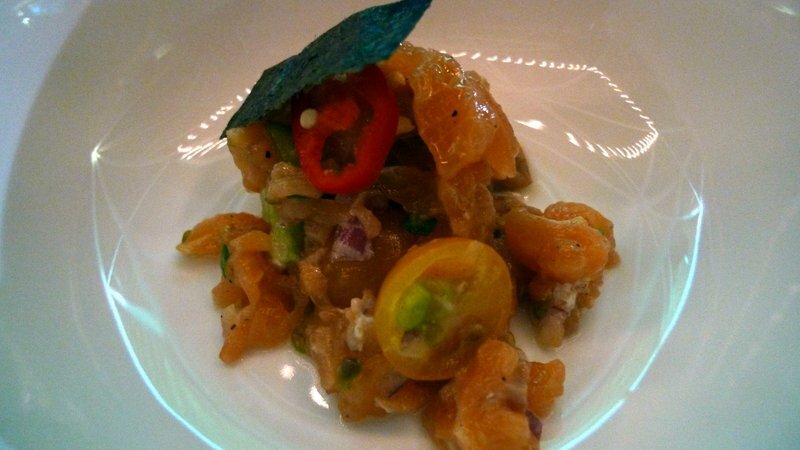 In this case, the vinaigrette made the poke into more of a ceviche. It was okay in itself but the accompanying beer, an Anderson Valley Poleeko Pale Ale, was excellent. 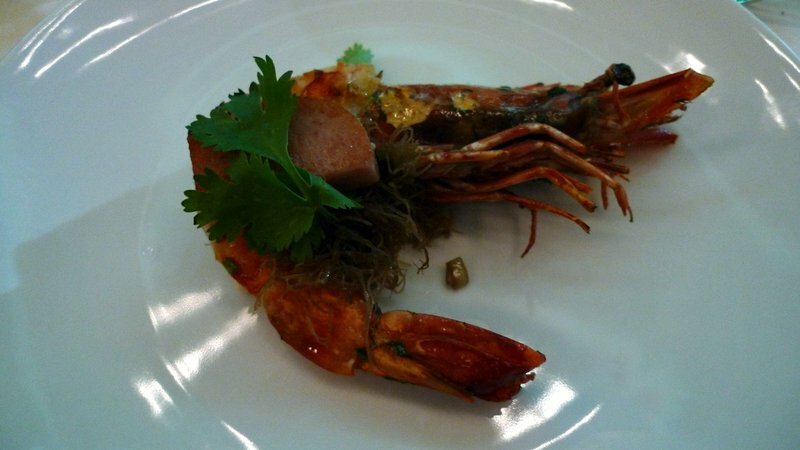 Second course was a grilled prawn with ogo ogo seaweed salad, basil, and Spam. When preparing prawns for large groups, the risk is that the prawns will be overcooked. In this case, the prawns were actually slightly undercooked. The seaweed salad was underwhelming and the prawn lacked seasoning. The addition of Spam (and cilantro instead of the basil listed on the menu) added nothing to the dish other than a convenient shortcut to make the dish more “Hawaiian”… kind of. Paired with an enjoyable Anderson Valley Boont Amber Ale. The third course was very nice, a spicy lomilomi salmon with heirloom tomatoes and coriander. Lots of lomilomi salmon in Hawaii is served with smoked salmon of so-so smoked salmon and is usually too heavy on the tomatoes. In this case, the salmon was excellent and there was plenty of it. Assertively flavored, it had a nice kick. The course was served with an Anderson Valley Solstice Cream Ale, which tastes heavily of cream soda and didn’t do much for me. 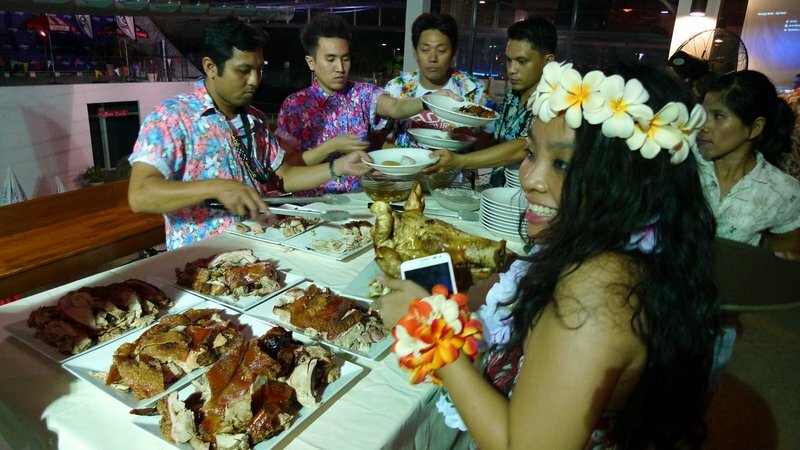 After a long wait, the whole roasted pig was served. It was ostensibly served “family style” but that meant that we needed to walk over to get our plates. The pig was very flavorful and moist. 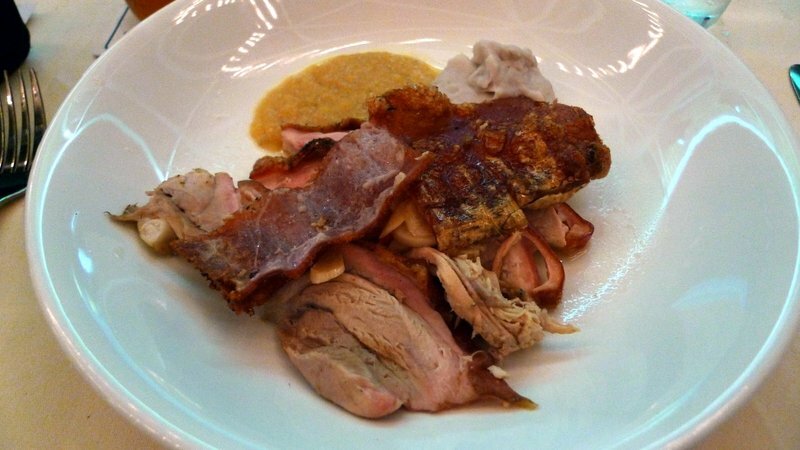 Pieces of crisp skin were enjoyable but the skin attached to the sliced meat was rubbery. The taro puree and pineapple lime confit, while simple, were nice accompaniments for the pork. This was served with a Rogue Yellow Snow IPA, which was nice but I soon reverted to some more of the Anderson Valley Poleeko Pale Ale served with the first course. 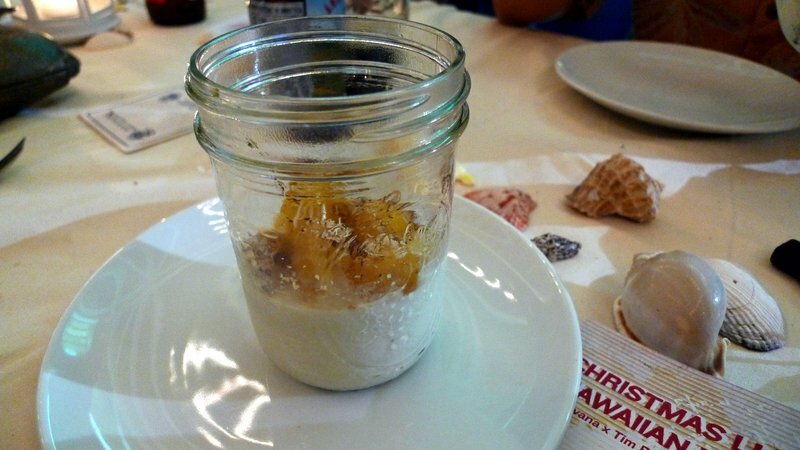 For dessert, we were served vanilla coconut custard with roasted pineapple and rum. 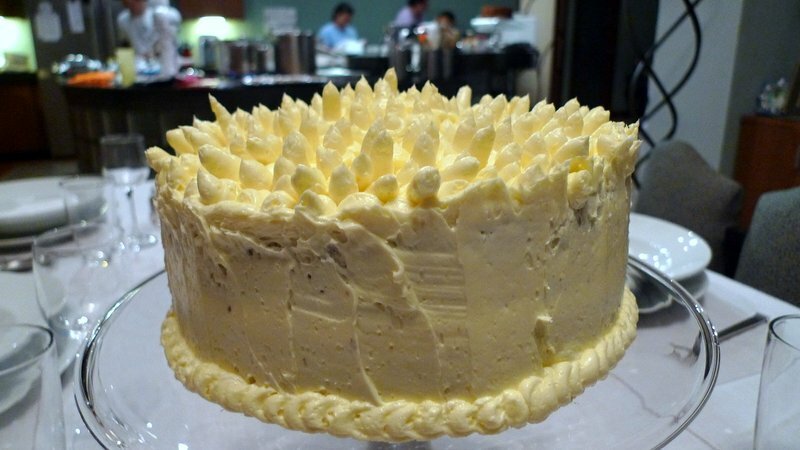 This tasted okay but way too much gelatin had been used so the custard was rubbery. The pineapple went well with the custard, though. Served with a Rogue Chocolate Stout that complimented the dessert but I don’t like stout – too bitter for my taste. All in all, it was a fun evening. It is fun to try a new experience and the idea of pairing beer with food is an interesting one. The beer was a bottomless flow, so if I were more of a beer drinker, it would have been heaven. Instead, it was just a slice of beach in Bangkok. There are moments when I feel like there is little point in writing entries about meals, about my garden, about interesting sights I see here in Bangkok. This is a period of time in which there are a lot of uncertainties, a lot of decisions to be made, and it is hard to whip up my enthusiasm to write posts about the more pedestrian aspects of my life. Being an adult is about making the choice to do the correct thing, even when it would be easier or more pleasant to do something else, right? Using your credit card internationally is a convenient way to pay for things. Less risky than cash, credit cards also offer a lot of protections. Sometimes, though, paying with credit cards while traveling can turn into an expensive proposition. Unexpected fees, unknown conversion rates, and other costs creep onto your statement. Even with credit card companies that profess not to charge any fees for international use, you never know if the exchange rate will be favorable. It is no surprise, then, that a popular – and legitimate – scam that purports to provide travelers with the convenience and security of locking in their exchange rate at the time of purpose, is becoming more common. [ ]I accept that the selected transaction currency is USD and is final and acknowledge that I had a choice to pay in THB. I accept the conversion rate and final amount and the currency conversion is conducted by merchant and is not associated with or endorsed by Visa. 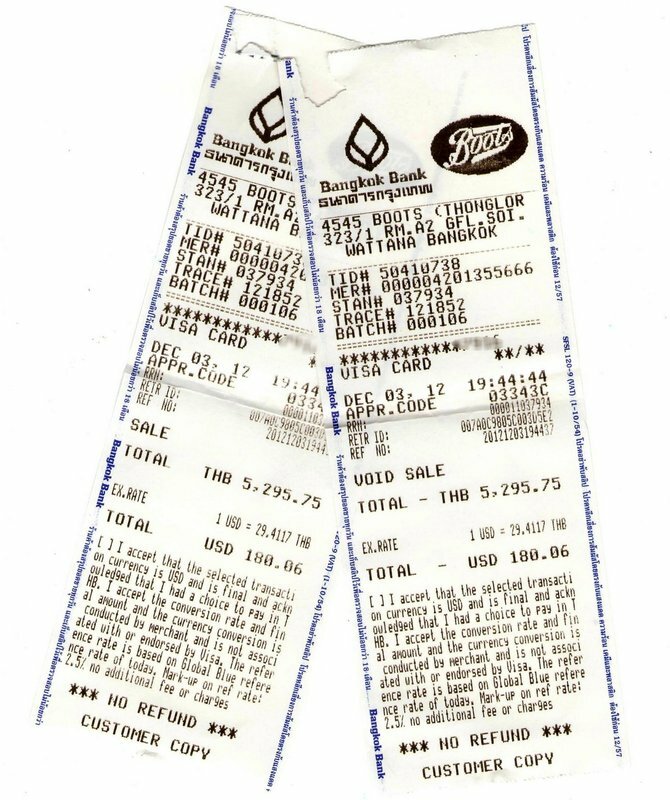 You may think that if you want to pay in the local currency, all you need to do is leave the box unchecked and then sign the charge slip. Of course, the staff will simply check the box afterwards and you will be charged the DCC. Who does this? Here in Thailand, I’ve noticed that credit card machines powered by Bangkok Bank seem to be the most frequent ones pushing the DCC. Boots, a British-based personal goods chain, is a regular offender. I’ve also received reports from friends of King Power, the company that has a monopoly on duty-free goods at Bangkok’s two airports, does this, too. I’m sure these two companies are hardly alone. The impact of DCC on your bank account is significant. A recent charge of THB 5,295.75 was “conveniently” converted for me to USD 180.06. I declined the conversion and insisted on being charged in Thai Baht. The charge that hit my credit card statement was only USD 173.00. The DCC represented a 4.1% charge over what my Visa credit card issued by Chase Bank charged me. Travelers abroad, permanent expats as well as tourists, need to be vigilant for Dynamic Currency Conversions. If you are presented with a charge slip that has your home currency, or any other non-local currency, listed, refuse to sign the slip. Insist that the charge be refunded and that another charge slip be prepared in the local currency. If you are so inclined, you can also speak with the store’s management and let them know what you think of the practice of providing DCC as the default payment option. It is hard to imagine that the extra income these businesses earn doesn’t factor into their decision to offer this “convenience” for their customers. 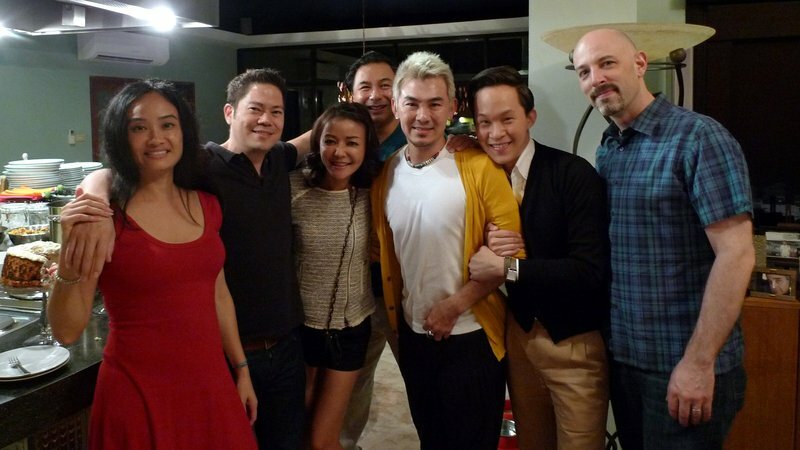 Recently, we had a friend visit from San Francisco who is vegetarian, trending vegan. Now, I spent two years or so in university as a vegetarian, so my reaction to vegetarians isn’t inherently hostile. Plus, unlike some vegetarian friends we’ve had visit, this friend is very low-key about what he eats and that made it a lot easier to accommodate him. That said, the experience of trying some vegetarian Thai restaurants here in Bangkok was not so positive. During his visit, we ate at two restaurants that are specifically vegetarian. The better of the two, which I’ll write about here, is Khun Churn. A 15-year old Chiang Mai restaurant, Khun Churn opened a branch a few years ago in the basement of the Bangkok Mediplex building, adjacent to the Ekkamai BTS station. The retail floors of the building are largely deserted and arriving at 7:00 one evening, we almost gave up on the restaurant being open, so many lights were already turned off. We arrived to find a friendly and inviting space, though, nicely decorated and with welcoming staff. The menu is comprehensive and accommodates not just vegetarians but eaters of “Buddhist Jae” food, a sort of strict veganism that also includes no garlic, shallots, and certain other foods that overstimulate the senses. The kitchen is able to mix and match as you desire, leaving out ingredients that you don’t eat or including them if you do. Our meal got off to a particularly good start with Miang Takrai Bai Chaplu – a version of Miang Kham, a popular Thai appetizer. 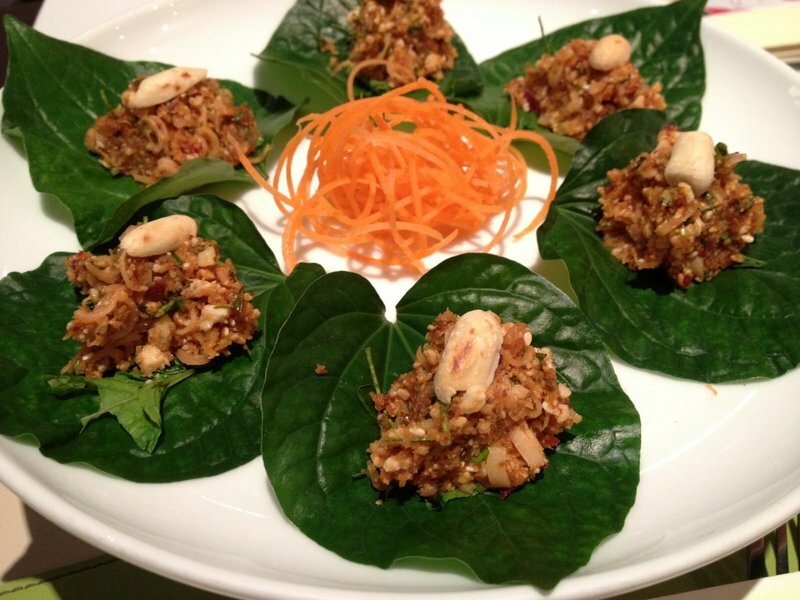 The normal dish features betel nut leaves served with a variety of condiments – small pieces of lime, shallot, peanut, dried shrimp, fresh chili, and ginger. 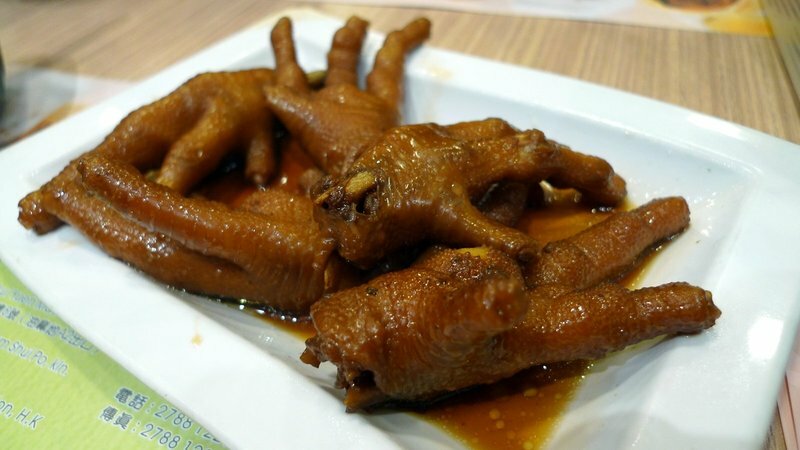 The name means, roughly, “many things in one bite,” and provides a nice way to perk up your taste buds in anticipation of the meal ahead. Khun Churn’s version contains sliced lemongrass, mint, roasted sesame, ground peanuts, roasted coconut, cilantro and chili paste blended together. Needless to say, the flavor packs a wallop and is intensely interesting. Sadly, the Miang Takrai was the flavor highlight of the meal. The next dish was Kuayteaw Lord, noodle rolls stuffed with tofu, black ear mushrooms, bean sprouts, and served with a black sweet and sour sauce. These were okay, but the sweet and sour sauce (mostly sweet) was the first of too many dishes that relied on the sweet soy sauce. 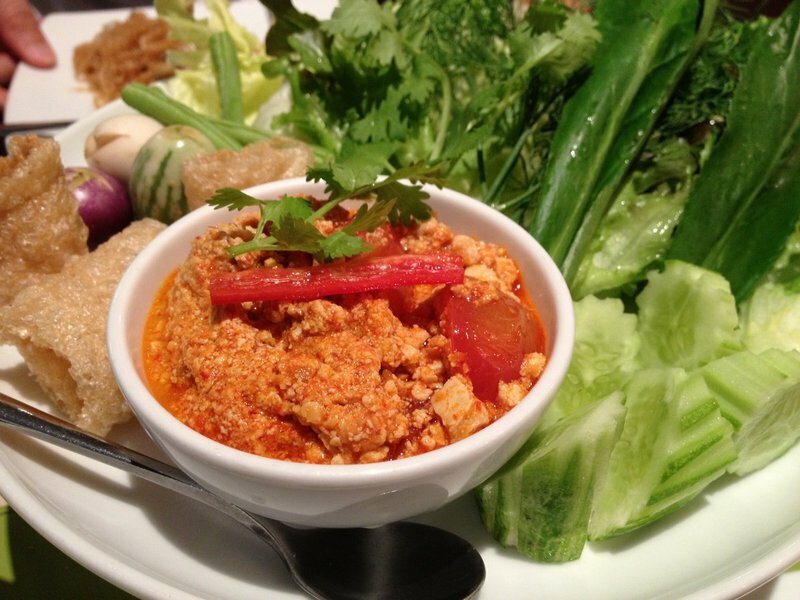 Thai food is known for its balance of flavors – sweet, salty, sour, bitter, and spicy – and all too often, “sweet” was the dominant note. The next dish was called “Merry Mushroom” and featured three types of mushrooms – erringi, Shitake, and oyster – breaded, deep fried, and served with an garlic and onion cream sauce. Well, that’s what the menu said. It was not a cream sauce, but was a soy, garlic, shallot, and coriander sauce. The Shitake mushrooms stood up well to the deep frying but the erringi and oyster mushrooms tasted like breading and nothing else. The sauce was okay, but didn’t stand out. For the next dish, our guest asked us to order Pad Thai, so we ordered a version called Pad Thai Woon Sen, made with mung bean (“cellophane”) noodles rather than the typical wide rice noodles. This version was less sweet than many of the other pad thai dishes he had eaten on this trip, but the overall flavor was still a bit one-dimensional. 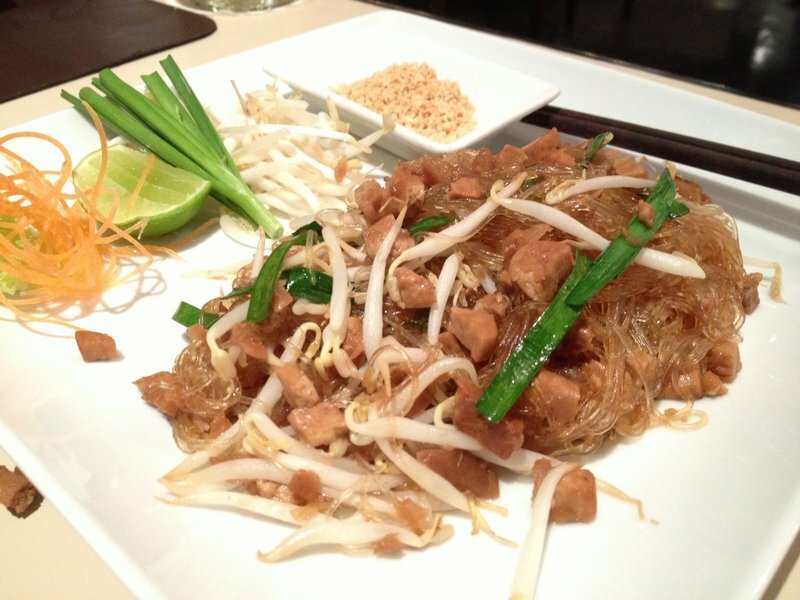 Pad Thai relies on tamarind paste to form the sour base of the sauce. Without fish sauce, the dish ended up unbalanced and some sort of salt would have helped round out the flavor. Since Khun Churn is a northern Thai restaurant, it seemed appropriate to try a famous northern dish, Nam Prik Ong. 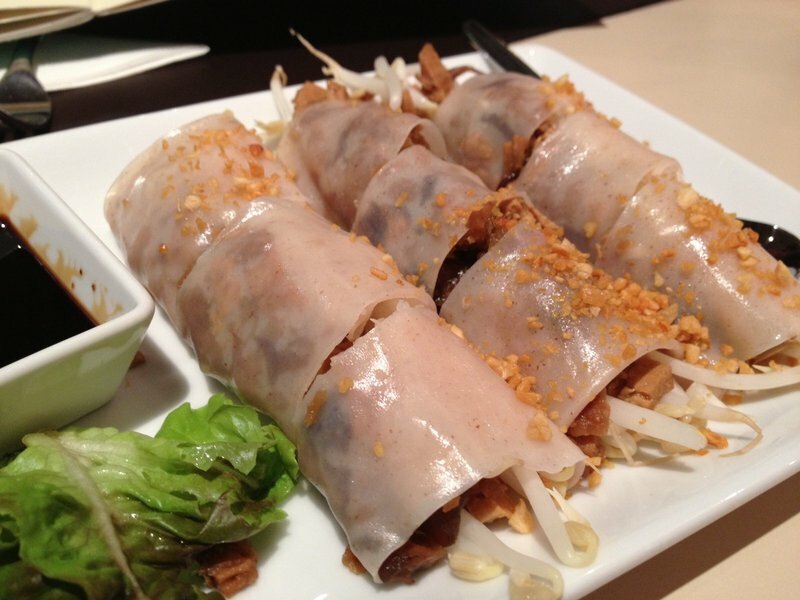 This dish is usually made with chili paste, ground pork, and tomatoes and is served as a dip for fresh vegetables and deep fried pork skin. Here, tofu was used instead of pork and the pork skin was replaced by a clever “tofu skin” that achieved the same texture in the hot oil. I hate to say it, but tofu makes a poor substitute for pork because tofu doesn’t add any flavor. 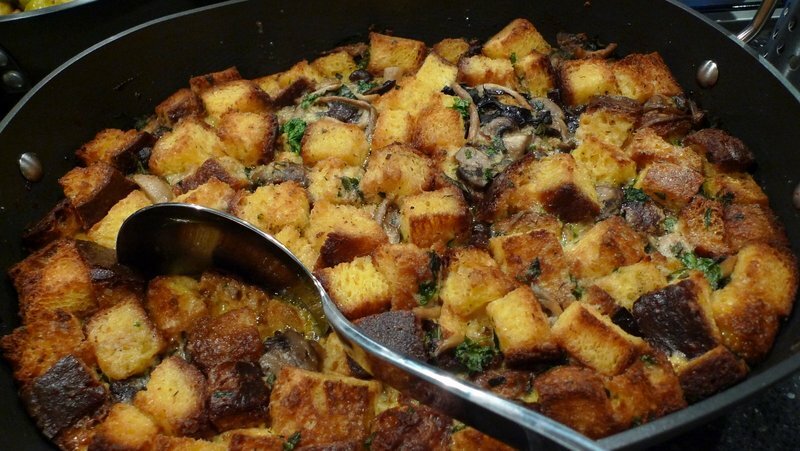 Something – a little concentrated mushroom stock, perhaps – was needed to give the dish its characteristic meatiness. 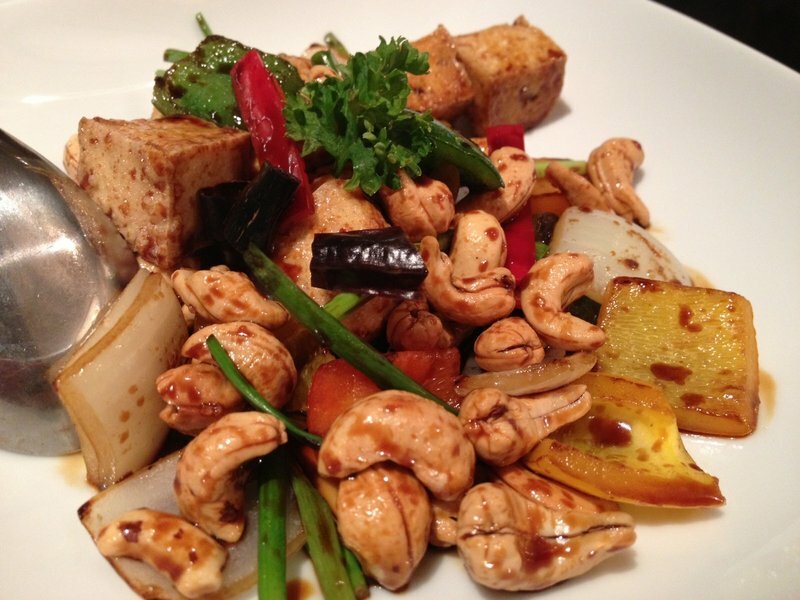 We ordered another take on a classic dish, chicken stir fried with cashew nuts – Gai Pad Med Mamuang. This version substituted tofu for the chicken. 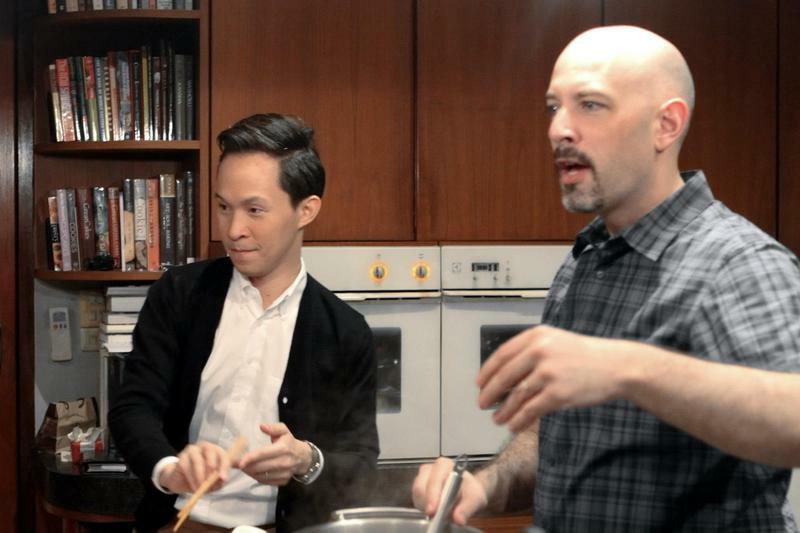 The problem is, the original version (one of my favorite dishes) is made with oyster sauce or fish sauce, which gives the dish that satisfying umami flavor. Instead, they relied on sweet dark soy sauce which gave the dish a very sweet flavor but lacked the roundness or robustness that would have made the dish satisfying. Again, a pinch of salt or some mushroom stock might have helped deliver the missing element. 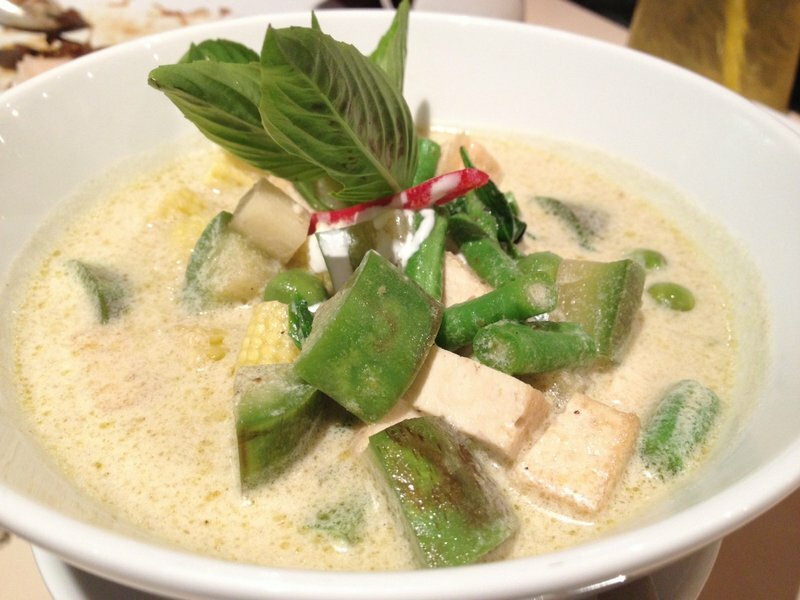 We concluded with a Gaeng Kiaw Waan – a green curry with tofu and vegetables. I was curious to try this because the previous Thai vegetarian restaurant we had been to served such a miserably watery version of this classic curry. 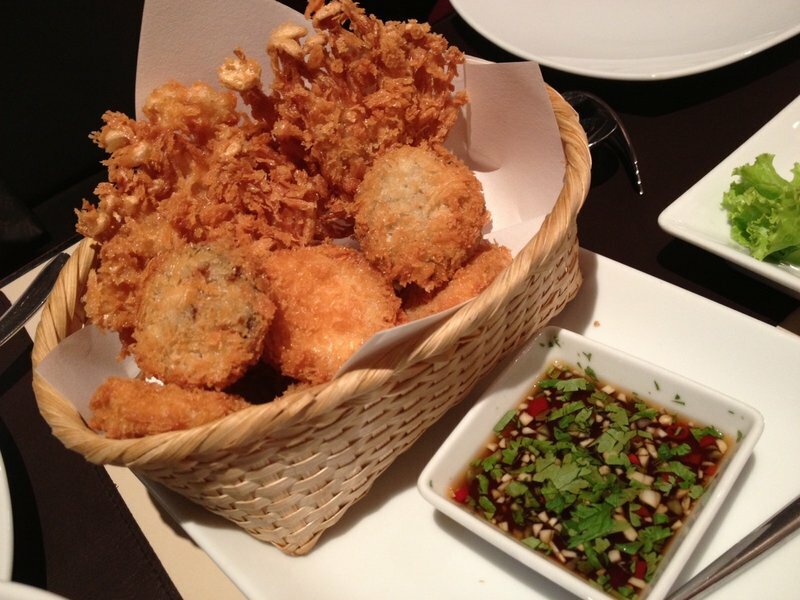 The version at Khun Churn was more robust and had a creaminess that was enjoyable. Sadly, the flavor was still very sweet and lacked the necessary balance. As a whole, the meal was good but not enough to make me want to return to the restaurant on its own merits. Instead, it will remain filed in that dusty category of places to bring vegetarian friends to. Afterwards, we walked across the street to the Gateway mall, a Japanese themed mall, to enjoy some Japanese style shaved ice desserts. 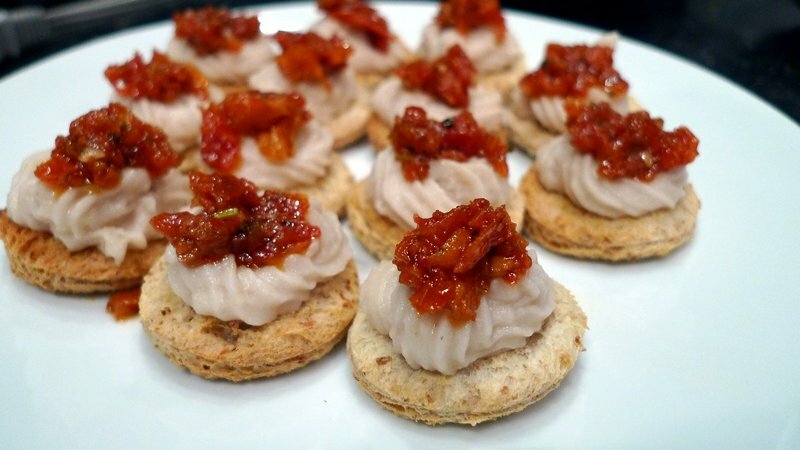 This is when vegetarian dishes being very sweet is okay! I don’t mean for the title to sound sexist, as this cake could be enjoyed just as well by a little girl, but when I saw it sitting on the counter at the Mandarin Oriental Shoppe at Emporium Mall, I thought immediately of a certain nearly four-year-old boy with whom I recently had a long conversation about the names of the different Marvel superheroes in The Avengers. The conversation went in circles around the character Hawkeye, who is his favorite superhero. I was telling him that Hawkeye’s alter-ego name is Clint Barton in the same way that Spiderman is also known as Peter Parker and Batman as Bruce Wayne. For some reason, even though he knew of Spiderman and Batman’s alter-ego names, he couldn’t grasp my explanation of Hawkeye and Clint Barton. I tried both Thai and English, but for some reason he just wasn’t buying it. His mother also tried to explain it, to no avail. 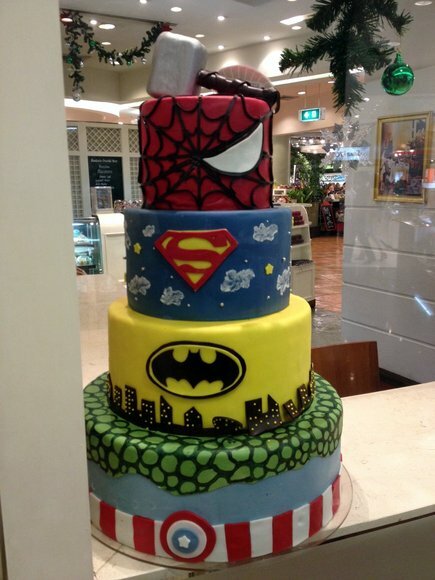 Sadly, Hawkeye isn’t represented on the cake.